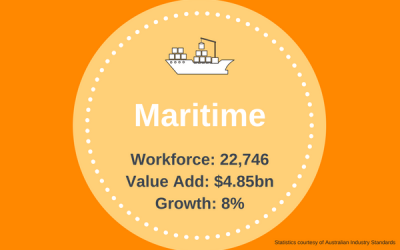 The Maritime industry in Australia has an estimated annual revenue of $9.3 billion, adding $3.7 billion to the Australian economy in 2015-16 (Australian Industry Standards, 2016). Australia is currently the world’s 5th largest shipping nation in terms of the tonnage of its inbound and outbound freight task. 10 per cent of the world’s sea trade passes through Australian ports and 99 per cent of Australian trade is transported by sea. Our coastline is over 60,000 kilometres in length and our search and rescue region covers more than 10 per cent of the earth’s surface. Per capita, Australia has more cruise passengers than any other nation, making it the fourth-largest cruise market in the world.